The world of technology has been making quantum leaps in the last few decades with Virtual Reality (VR) and Augmented Reality (AR) taking off in the last few years. VR and AR are now starting to integrate the realm of healthcare with staggering results. Not only are medical professionals utilizing the latest technology but it is also getting into the treatment rooms to improve the care of patients. The use of VR and AR is just starting to scratch the surface of its capabilities but what it has been able to accomplish thus far is extremely impressive. Effective training of medical professionals has been dependent on use of cadavers and trying to simulate procedures but they are not as accurate as they could be. A study published in 2013 by Nagendren et al, examined the effects of laparoscopic surgical trainees using VR and found they had decreased surgical times and errors when compared to box training. Doctors are able to get a more realistic experience of performing the surgery then if it was simulated. The authors are quick to point out the financial impact of such training is unknown but the results are very promising. The use of VR allows more doctors to experience and practice all over the world. In April of last year, Dr. Shafi Ahmed became the first doctor to use VR in surgery where doctors all over the world could see and experience what he was through the tumor excision procedure. The amount of knowledge that can be cultivated around the world through medical professionals is limitless with this technology. 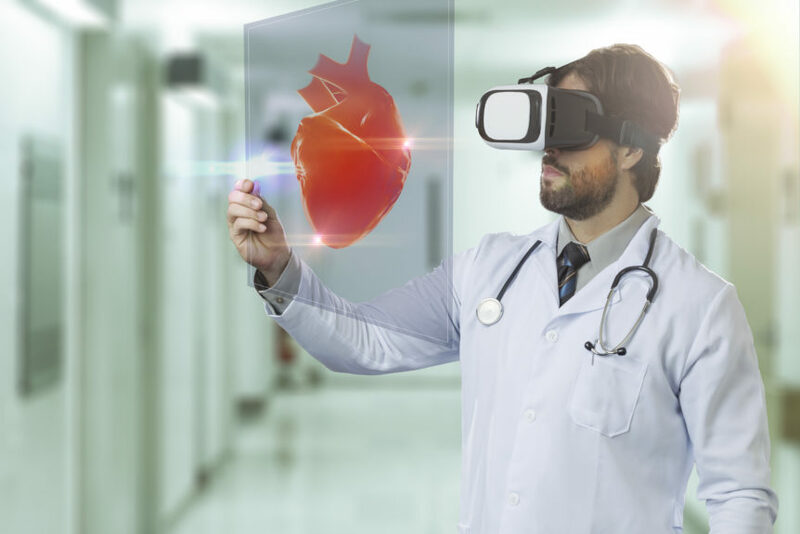 Virtual Reality is also helping physicians connect and empathize with their patients. One project called “We are Alfred’ allows young physicians to experience what it’s like to be elderly. Limitations in mobility are demonstrated through the simulation in order to shorten the gap between young doctors and their aging patients. There have also been simulations made to mimic the world view for a patient with dementia and failing eyesight, allowing caregivers and doctors to understand the struggles the patients have with navigating a sometimes confusing and blurry place. The power of empathy is immense and often lost in the ever-busy field of medicine. Doctors aren’t the only ones getting in on the fun of strapping on the eye wear and being transported to another time. Patients are seeing great results in their care with the creation of VR and AR. Impressive results are coming out with the use of VR in pain management. Burn patients reported significant decreases in pain and improvements in range of motion when using VR during physical therapy treatment. It has been shown to improve the wound debridement process as well. Promising new research is also showing positive effects on chronic pain patients through mirror therapy simulations. Patients are more immersed in the environment tricking the brain more than the traditional mirror treatments. Pain reductions have been shown to stay consistently low meaning there isn’t a novel effect of the game but could be useful in long term pain management. Physical therapy exercises can be a little mundane but put on a VR headset and you are transported into a fun environment where the games become your exercises. VR has been shown very effective in the treatment of patients who had strokes. MindMotionPro, a program developed in Switzerland, helps patients with strokes and traumatic brain injuries to practice moving their affected limb using VR. The patients might not actually move their arm but it helps to work their healing brains to repair those damaged connections. Time and practice are essential with improving the neuroplasticity of the brain. Virtual Reality and Augmented Reality adds a level of fun and challenge that has been shown to increase the time a patient is really to participate in their rehabilitation. The world of VR and AR is booming and becoming much more accessible to the general public. It is becoming easier for developers these days to create these alternate spaces and I predict we will see a lot more application to healthcare in the next decade that will benefit everyone from the doctors to caregivers and patients. Nagendran M, et al. “Virtual Reality Training For Surgical Trainees In Laparoscopic Surgery. – Pubmed – NCBI”. Ncbi.nlm.nih.gov. N.p., 2017. Web. 15 June 2017. Li, Angela et al. “Virtual Reality And Pain Management: Current Trends And Future Directions”. N.p., 2017. Web. 15 June 2017. 5 Ways Medical VR Is Changing Healthcare. The Medical Futurist. http://medicalfuturist.com/5-ways-medical-vr-is-changing-healthcare/. Published July 21, 2016. Accessed June 15, 2017.